There are several advantages of using stored procedures instead of standard SQL. First, stored procedures allow a lot more flexibility offering capabilities such as conditional logic. Second, because stored procedures are stored within the DBMS, bandwidth and execution time are reduced. This is because a single stored procedure can execute a complex set of SQL statements. Third, SQL Server pre-compiles stored procedures such that they execute optimally. Fourth, client developers are abstracted from complex designs. They would simply need to know the stored procedure's name and the type of data it returns. CREATE PROCEDURE [dbo]. [GetProducts] AS SELECT ProductID, ProductName FROM Products Click on the Check Syntax button in order to confirm that the stored procedure is syntactically correct. Please note that the GetProducts example above will work on the Northwind sample database that comes with SQL Server. Modify it as necessary to suite the database you are using. A very nice aspect of ADO.NET is that it allows the developer to call a stored procedure in almost the exact same way as a standard SQL statement. 1. Create a new C# Windows Application project. 2. From the Toolbox, drag and drop a DataGrid onto the Form. Resize it as necessary. 3. Double-click on the Form to generate the Form_Load event handler. Before entering any code, add "using System.Data.SqlClient" at the top of the file. Using other SQL statements such as INSERT, UPDATE or DELETE follow the same procedure. 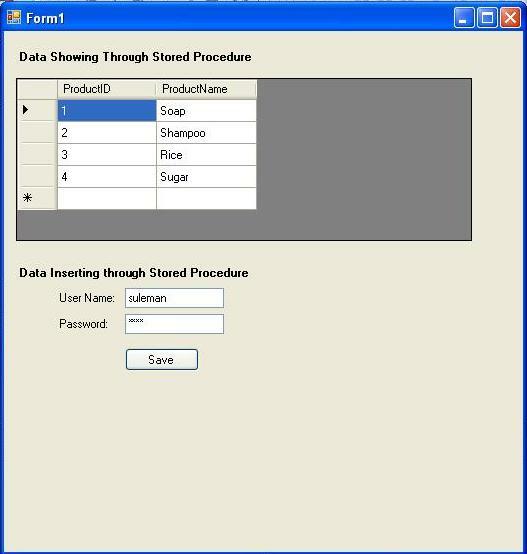 First, create a stored procedure that may or may not accept parameters, and then call the stored procedure from within the code supply the necessary values if parameters are needed. The following example illustrates how to insert a new user in a users table that has a username and password field. SqlConnection conn = new SqlConnection"
First, we retrieve the username and password information from the user. This information may be entered onto a form, through a message dialog or through some other method. The point is, the user specifies the username and password and the applicaton inserts the data into the database. Also notice that we called the ExecuteNonQuery() method of the Connection object. We call this method to indicate that the stored procedure does not return results for a query but rather an integer indicating how many rows were affected by the executed statement. ExecuteNonQuery() is used for DML statements such as INSERT, UPDATE and DELETE. Note that we can test the value of rows to check if the stored procedure inserted the data successfully. We check the value of rows to see if it is equal to one. Since our stored procedure only did one insert operation and if it is successful, the ExecuteNonQuery() method should return 1 to indicate the one row that was inserted. For other SQL statements, especially UPDATE and DELETE statements that affect more than one row, the stored procedure will return the number of rows affected by the statement. Stored procedures offer developers a lot of flexibility with many features not available using standard SQL. ADO.NET allows us to use stored procedures in our applications seamlessly. The combination of these two allows us to create very powerful appliations rapidly.